The people from PIOMAS have done an extra data release (there'll be another one next week for all of the August data). This data shows us that yet another record domino has fallen, after so many others already. This is one of the biggest dominoes out there, especially now that observational data from CryoSat-2 is largely confirming PIOMAS modeled data. It's all about the volume. Here is Wipneus' version with the calculated "expected" 2012 values (dotted lines), based on the same date values of 1979-2011 and an exponential trend. A caveat from Wipneus: "Note that the statistical error bars are quite large." Statistical error bars aside, the trend line follows the dotted forecast line almost to a T.
The average thickness is just as low as 2010 and 2011, but that's also because the current total area is respectively 791 and 603 thousand square kilometer smaller. There's a lot less ice than there has been for a long, long, time. This record has been broken, just like all the others, but minimum hasn't been reached yet on most of the charts. We now await those. We also patiently await a record on the IMS sea ice extent chart (the last ice floe fake skeptics try to stand on), NSIDC September average extent, CT SIA anomaly, perhaps even CT global SIA and anomaly. Because of the upcoming US holiday weekend and the interest in the sea ice minimum we have updated PIOMAS through Aug-25. Sea ice volume on Aug-25th was 3500 km3 about 500 km3 less than the prior minimum on September 10 2011. This difference is within the estimated uncertainty of PIOMAS. 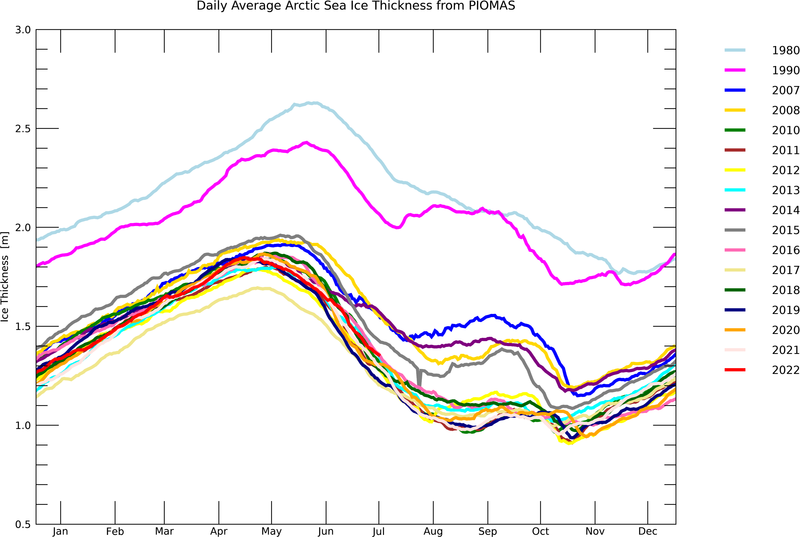 From March through July 2012 the average ice thickness over the PIOMAS domain was smaller than in any previous year. While ice volume continued to decrease through August, the average ice thickness increased in August as areas covered by thin ice became ice free leaving thicker ice behind. (Still) to do on request: Dual Y-Axis Integrated Volume/Extent/Area chart (PIOMAS August 2012 thread). I'm going to use the NSIDC extent for this and CT Area to avoid any breaks or discontinuities. P.S. Continue to see old charts, expired days ago... the Photobucket image mirroring is slow. Someone, somewhere, on a blog, said something about the inevitability of the return of sea-ice each winter, which set me thinking about heat storage in the Arctic Ocean and the ice-albedo feedback. So I had a look at the monthly mean extent trend plots from NSIDC, such as for May, which is the month with the lowest rate of decline. June also has a low rate of decline, in the slow half of the year, and these are two months near the summer solstice, in late June, when the potential for the ice-albedo feedback is at its greatest. What this suggests to me is that the decline of Arctic sea-ice is only just getting started, and an ice-free date in September in the near-future is just the end of the beginning, rather than the beginning of the end. When the sea-ice decline in May and June starts to take hold, then we'll really see the ice-albedo feedback at work, and there will be all manner of rapid changes. "While ice volume continued to decrease through August, the average ice thickness increased in August as areas covered by thin ice became ice free leaving thicker ice behind." This is an important point that may be useful if any spurious claims are made WRT average thickness! "What this suggests to me is that the decline of Arctic sea-ice is only just getting started, and an ice-free date in September in the near-future is just the end of the beginning, rather than the beginning of the end. When the sea-ice decline in May and June starts to take hold, then we'll really see the ice-albedo feedback at work, and there will be all manner of rapid changes." I think what's really happening is that all the positive feedbacks are kicking in due to the presence of significant open water. The past may be an overly conservative predictor of the future under these circumstances. ""While ice volume continued to decrease through August, the average ice thickness increased in August as areas covered by thin ice became ice free leaving thicker ice behind."" An important point, but needs to be re-worded for clarity. to PIOMAS version. PICT has 1.4m thickness but PIOMAS has thickness of less than 1.2m. 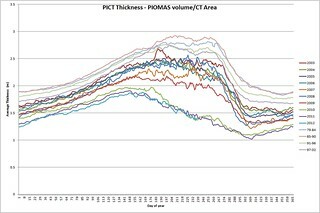 So with volume of 3.599, PIOMAS area is over 3 M km^2 (vs CT 2.53). There is assimilation of ice cover I believe so is this 3M Km^2 some sort of multisensor area? As the pack solidifies as it starts to freeze, there is less supply of smaller bits which melt out resulting in the difference between multisensor and passive microwave decreasing. We have seen this with MASIE reducing rapidly in last 4 days and air temps in dmi N of 80N temperatures are above average indicating freeze up is beginning and giving off heat. So with that we would expect PIOMAS thickness to have started to move towards PICT thickness and indeed that can be seen. There is still quite a difference, so will the PIOMAS thickness graph show a spike upwards towards 1.4m? Sounds a bit strange but maybe possible? Alternately, as the area becomes multisensor ice free, the volume might need to be adjusted downward. In which case we might expect further substantial drops from the current 3.599 K Km^3 volume. In terms of overall volume lost, it's true that 2012 is still behind first place 2010. But in terms of the percentage of volume lost, 2012 is clearly in first place, with 83.59% (to 2010's 81.71%). Well that should be about it for dominos from reputable sources. Maybe for #10, we should have the amount of ice that can fit in in the ocean area above 80 degrees north. By my calculations, that should be around 3.6 million km^2 (after taking in account all land mass above 80 north). Another record broken yesterday. First sailing of the most northern route of the North West Passage, by a small sailboat. With that early August Polar megastorm push a lot of ice into the McClure strait, I did'nt expect them to make it but they did. The bar-graph version of PIOMAS is striking, there's not that much room left to 0. And this is just through Aug 25! Thanks for the data and graphs - stunning and sobering info. 1. Why this chart may not indicate a statistically significant downward trend. 2. Why this might not be 'scientific' evidence of a warming arctic ocean. 3. How this could possibly be happening in spite of 'Global Cooling'. And how come a "tropical" cyclone ended up in the Polar Sea? Looking at Wipneus' daily volume graph, and all the pretty colored lines swooping up, then down, my eye wanders up to the gray line at the top and I idly find myself thinking, "Gee, what is that up there? Looks like something from a different Earth epoch maybe." But no, of course it is not. Only the average from 1979-2001. That creepy feeling arises, ominous background music slowly gets louder. I look at bit longer. The lowest part of the gray line is around 14. Hmmm... in less than a month, we will be around 3. And then the mind reflex kicks in again "No. Can't be. Impossible. I'm looking at something from a freak show." The instinctive urge to deny when faced with such things and their implications is so real. My prediction last spring that "all melt records will be obliterated" will not be correct unless we also achieve the largest sea ice anomaly. That record is still held by 2007. That is domino 10! However, it is time to start taking bets on when we will see substantially no sea ice on June 21 of which year? I have to change my bet to 2015 because of a failure to account for snow. I am sorry this is not a betting office! 2007 had the advantage of clear skies which allowed a lot of solar radiation to warm the ocean. The loss of heat from the ocean before the ice could reform was what lead to that record low anomaly in 2007. So I really don't think it's reasonable to compare the current record anomalies with that highly unusual situation. I view comparing anomalies now with anomalies late in the season as unsound on a physical basis. Bottom line - CT area anomalies are record during the period of ice loss - that's indicative of the state of the pack in and of itself. Around August 20th, Goddard compared the current MASIE ice map to the NSIDC SIE 2007 minimum map (what a b-hole) and stated "With over 700,000 kms left to go, this years minimum reaching the 2007 minimum is impossible". His site is now reduced to only showing the IMS map which is still being compared to the NSIDC SIE 2007. It's only a matter of time till they start stating the old numbers in square miles and the new ones in square kilometers to make them look bigger. Has anyone noticed the last frame of the ice drift animation at HYCOM (valid 9/5)? It projects a strange rotation in the east with a very strong outflow pattern. Is there a new major storm brewing? Any thoughts on what ejected ice at those latitudes is likely to do? Cyclonic (low pressure) systems cause net divergence, so this might conceivably bring extent drops to an end. You can see the divergent tendency in the image you link to. But it all depends on where the low pressure is centred. Your HYCOM image is for 5/9/12, that far ahead it's hard to say where the centres will be and what will be happening around them. I see there is a link to a denialist article in the news links: "Arctic Sea Ice Record Low Is “Broken” - Energy Tribune". I presume this is a mistake. 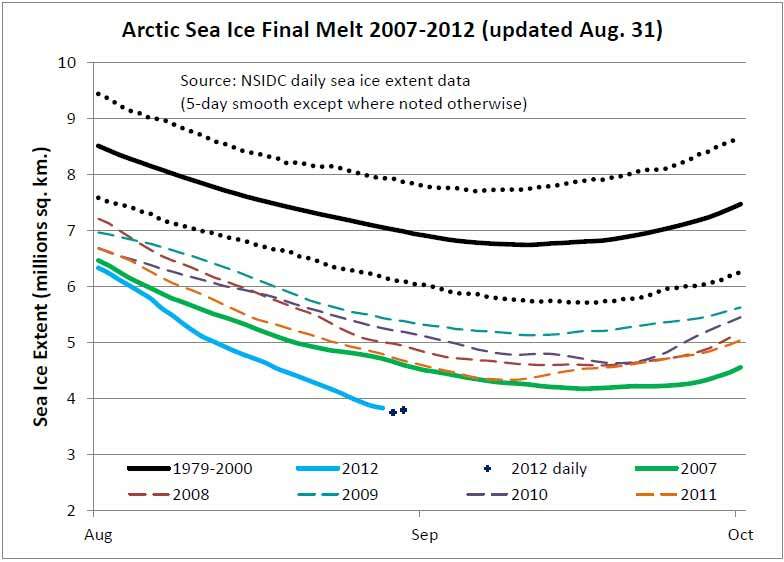 Slightly off topic, but I've been looking at your domino 10: NSIDC September sea ice extent. My most recent projection (Aug 27) is 3.57 +/- 0.13 million sq km. (Today the model stands at 3.54 and should be fairly stable from here on, as actual September data arrives). There are also signs of flattening in NSIDC data for the last three days, as one would expect around now. (See also updated chart). I have been reading this blog from July 6 until now, and I just want to congratulate Neven and the others for the quality of the Arctic Sea Ice Blog. It has been a great experience and I learned a lot. So thanks for the information that you are giving to others. Juan C. Garcia from México City. Alan - the links on the upper right are auto-generated, not selected by Neven. If those "scientists" don't even know you have to shake down the thermometer to calibrate it first, they are sooooo fired. Even my mom knew that. On a serious note. Here is a really truth/myth situation. Right after 9/11 somebody started a story that the terrorists got in the US through that undefended siv of a border from Canada. That was quickly proven totally false. To this day though, those crying for the need to close down that border bring up the 'fact' that those terrorists entered the US via Canada. We lay out the truth, we try our best to defend our integrity, but a good many Americans to this day believe the myth. The same problem exists with the ice. If you are convinced that the ice can not melt or that it really does not matter, you will believe the myth no matter how much you can prove that truth. She also darn well knew where to place it! OK, yes, serious notes... ah-hem. On the matter of convincing smart American folks about truth. Well, many are convinced about bigfoots, forged birth certificates, faked moon landings, second assassins, chemtrails, fairies, dragons, reptile people, and the many health benefits of a Budweiser an Pringles diet. When you ask them to move onto sciencey things like the fact that ice can melt, it turns out they don't have much room left for the abstract. UFOs are real though. And maybe dragons. Don't lump people who question the Warren Report with your other lunatics ! Which group of lunatics to the Warren Report questioners belong in? GAC-2012 was NOT a tropical cyclone, it was a cold-core (extra-tropical) cyclone. Certainly it was very large, powerful and long-lived, with exceptionally low central pressure and strong winds but none-the-less, not a tropical cyclone. All cyclones are heat difference engines, propelling moist air into a rotating vortex which transfers heat from the warm side to the cold side. With GAC-2012, the warm side was the airmass over Siberia, and the cold side was the pack ice in the Central Arctic Basin. The jetstream added further rotation to the gathering depression, reinforced by the Coriolis effect. Voilà, a massive storm was the result, one even more powerful than hurricane Issac which just devastated Louisiana (964 mb vs 970 mb central pressure). Note that a cold-core cyclone is the WORSE possible scenario for sea ice survival, since it moves heat from the South over the continent into the midst of the pack ice. And scientific studies show these storms are getting more frequent and more powerful since 2007. But remember this take-away point (when engaging deniers): the loss of sea ice caused this storm, NOT the other way around. This cyclone simply could not have occurred without vast areas of melt-out in the Arctic ocean, and the vast snow cover retreat in Siberia. When these conditions reoccur, it will happen again. The next big Summer cyclone could finish the Arctic sea ice. "Shaken AND stirred, with crushed ice." Yes i agree, and tropical was written "tropical". Will 2012 provide enough signal to pick out of the noise? What would we need to see to decide? On the tropical cyclone, was there a reply from Toninô's place to ES's query? The "tropical" will have confused the manure out of him, or became/becomes a non-direct argumentative escape point, but the cold-core-cyclone is a good description... what get's featured in movies, does have a cold "core" fact base, with wide artistic license. The Ozone layer will have a partial hole in this, similar to the theories that the Antarctic vortex got narrower and stronger because of this... cooling stratosphere. Anyway, the principle of operation is i deem it to be same... a large temperature differential to spin this up. Lodger said "Hi Larry, Will 2012 provide enough signal to pick out of the noise? What would we need to see to decide?" Yes Larry, whether it's exponential or Gompertz will pretty much tell us whether we have Winter ice or not in our (near) future. BTW Lodger, I really liked your explanation of cold core cyclones, and now we know why we had a "tropical" cyclone in the Arctic this Summer. Well, as far as the ice is concerned it is warm. You definitely shouldn't mess with ents. They take their time to react, but when they do, it's devastating. ... and you could loose the ent-wives. Dang, IJIS is down *another* 60,000 km2 or so this morning. We've been changing the climate for longer... we knew how to change [local]micro-climate in the roman times, it was just not referred to as 'climate'. 2.488 CT area (-38k). It's kind of a horrible fascination watching these plunge into new records, isn't it Kevin? The uni-bremen map today has the most prominent open water above 85° I can remember, in the Laptev bite. The MODIS images show it still has broken ice in it, but the hole is only about 340km from the pole if I estimate correctly. I am a first time poster with a question about the possible consequences of the recent dramatic changes to the arctic ice. First off: hats off to the blog founder and participants for pulling together the relevant data sources and for all the illuminating discussions. At a glance, the various graphs show a steady but linear decline in the various ice statistics until 2007. After 2007, the data seems to indicate a non-linear, feedback effect of some kind. It's hard to avoid the conclusion that the system will soon transition to a new steady state of ice-free arctic summers. The ice maximum still seems to be in the linear regime with a steady downward trend subject to some natural variability. Having stated my premises, here are my questions. 1) How stable is the new steady state going to be? Is it possible for the arctic maximum to transition to novel regimes? For example, every winter, despite the warming, Hudson's Bay and James Bay ice over. Is it even conceivable that warming can progress to a point where a body like James Bay will remain ice free over the winter? 2) The transition to ice-free summers in the arctic will have an impact on NH climate -- no doubt. However given that even a thin crust of ice interrupts the transfer of energy between ocean and atmosphere, the yearly refreeze should mitigate and stabilize any such impact. To put it another way, once we settle into the new regime, what will be the significant trends in ice statistics with respect to NH climate impact? Having said that, I have a particular fondness for the Gompertz curve as a result of using it for a lot of my growth descriptions for my postgrad work. It has a number of characteristics that permit it to depict well the characteristics of biological growth, and to do so with minimum parameterisation. I'm guessing that will likely apply nicely to Arctic Ice melt if the melt eventuates as sigmoid: if not Gompertz, a version of a Richards curve would almost certainly do the job well, aided and abetted as it is by its surfeit of parameters. Also new here......I understand that summer cyclones are rare but increasing in the Arctic. How often do winter cyclones occur and how early in the Fall can they show up? Given the fragile state of the existing ice, could an early winter cyclone wreak havoc on the remaining ice whereas in the past it would simply be a frigid snow generator? This fact is so under-appreciated. We have been using coal since the Bronze Age. At a miniscule scale back then (hey let's find some more of those black rocks and burn 'em!) back then, but still, it was already underway. By Britain in the 1700s, black rocks were burning as fast as they could be dug up. When anyone says something like "The record temps of the 30s couldn't have been AGW" - I say, think again. The hockey stick starting turning just a bit before the 80s. Slight correction: "The previous record temps of the 30s..."
Anyways, we really do underestimate our power and scale as part of nature. Constantly. 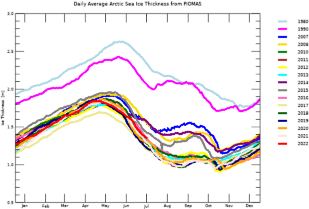 NCOF Godiva 2 August 30 and 31 sea ice concentration, thickness and kmz are updated. What would indicate "It's hard to avoid the conclusion that the system will soon transition to a new steady state of ice-free arctic summers." ? In specific, what makes you think ice free Summers would indicate any sort of steady-state? I'm in the camp that says the decline is exponential, that there is no immediate meta-stable state pending, and that largely ice free Summers will soon be followed by an essentially ice free Arctic. I basically think that the only thing really holding down Arctic temperatures is the conversion of ice into water, and that once that is complete the Arctic will become a temperate climate. "I basically think that the only thing really holding down Arctic temperatures is the conversion of ice into water, and that once that is complete the Arctic will become a temperate climate." The problem is - when the Arctic becomes temperate - its what happens to the rest of the planet that is so concerning. I prefer to just view it as change, and will let others invent values for that change. Obviously, if the Arctic as a whole is temperate then the Greenland Ice Cap is going to be stressed. I live on a hill overlooking Boston. Future valuable oceanfront property. Looking at the sea ice extent and thickness just posted, it looks as if almost half of the remaining ice is 1 meter or less in thickness. What would an early winter cyclone do to this ice, given the open water and wave action that would result? I can't imagine that an ice free Arctic in the winter would ever be possible with no sunlight for months. I would side with those who would suggest that humans began altering the overall climate character of this particular interglacial rather early in the Holocene. Through both land use changes and then the eventual massive burning of fossil fuels, we've been in an Anthropocene climate for many many centuries. Djprice537: "I can't imagine that an ice free Arctic in the winter would ever be possible with no sunlight for months." Imagine the gulf stream flowing on the west side of Greenland. Not saying it will happen, but the evidence so far is that the western boundary currents are getting stronger, warmer, and trending more pole-ward. I think what is meant is an ice free Arctic Ocean. The land will cool out faster without sunlight, with snow and everything, but if the sea has enough heat in it, it will eventually remain ice free. R Gates, there is some evidence that the Sahara was caused mostly by goats; which pull up plants and eat them rather than graze off of new growth. I guess you can attribute that to Humans, if you like. Well, maybe it is that I don't want to imagine that an ice free Arctic in the winter would ever be possible with no sunlight for months. Is it common for an Atlantic hurricane to first make landfall in Ireland, even downgraded to a tropical storm? Totally agree. The question I like to think about is what is nature's larger purpose in this process? I'm thinking about the Gaia hypothesis, and our role. If we accept the Gaia hypothesis on at least some level, then we are inescapably part of the workings of Gaia, in everything we do here that has at least some impact ecologically. Now, to be clear, I don't think that this is all about us, but just about the ongoing sustainability of maximum life on Earth, for as long as possible. What if Earth actually needs to be "reset" as Joe Smith mentioned in the "Anyone Cold" thread - taken away from being so close to ice house and longer term back closer to hot house in order for the best shot at making the most of the remaining 1 billion years of life friendly radiation output that the Sun has to offer? I think it is an extremely interesting possibility. We are not aliens here by accident, but an enormously large scale, deeply integral part of the process. I'm not saying that holding out hope for a larger purpose doesn't help me accept the coming radical changes with more equanimity than otherwise. But the more I think about it, there seems to be a larger, logical, if not incredibly mysterious, process at work. Humans + climate change = ? Of course, adding asteroid impacts to the Gaia hypothesis takes things somewhat out of the normally accepted concept of what Gaia is. But seeing our use of fossil fuels as part of Gaia is a similar leap. If the Earth-Sun system together is Gaia, it is not a far stretch to include other bodies in our solar system, nor is it far fetched to think that Gaia intended for stored carbon to be stored forever for no possible future reason. "The storm weakened at sea and made landfall on the Iberian Peninsula as a tropical depression on October 11. Vince was the first tropical system to do so since the 1842 Spain hurricane. it is neither the most northerly-forming nor the most easterly-forming Atlantic tropical storm; these records are held by Alberto of the 1988 season at 41.5° N"
I think that is enough to say not not common even as tropical storm. Systems that are post tropical however would be fairly common. Sorry, make that "nor is is far fetched to think that Gaia didn't intend for stored carbon to be stored forever for no possible future reason." Note to self: Double negatives can be tricky. Avoid. What if the reason that we've never encountered extraterrestrials is that every time an intelligent species emerges they inevitably discover that large amounts of energy can be extracted from burning the remains of their predecessors. This creates a greenhouse situation that causes their civilization to collapse before they are capable interstellar travel. A frivolous exercise for sure - but maybe a plot for a SF story. I wouldn't go so far as saying Gaia is mystical. Certainly there are many mysteries when thinking about the way the life-force works on a larger scale in our universe. This touches on a very strong feeling I have that our science is truly in the infantile stages in the larger scheme of things. Maybe mid-childhood to be generous. If there were/are any civilizations that made it past the earliest stages, or didn't have enough fossils to burn and create catastrophe (maybe just enough to provide a bit of a leg up, but no more) there science would have possibly tens of millions of years more to figure out some of the deeper science. Possibly part of that deeper science is that young bucks like us are always to be left alone, so the larger life-force can sort things out as it best sees fit. Read Hogan's Giants trilogy, and Clarke's 3001. I don't know about ice free during the winter months, but fifty million years ago there were alligators in the Arctic Circle, although they seem to have been able to withstand cooler temperatures than their relatives today. Our early Eocene Arctic temperature estimates imply that fossil alligators are valid paleoclimate proxies for mild, above-freezing yearround temperatures. Nevertheless, the Eocene Arctic alligators that inhabited evidently cooler winters (CMMT 0–3.5 °C) and summers (WMMT 19–20 °C) than what is implied by the present-day crocodilian distribution (Markwick, 1994) are intriguing. Wow. Here we go again. Late melt season cyclone in the central arctic. Woo hoo! Just how low can the ice go this year? Remember that the window for radiating heat from that open water to a sunless sky is slowly being cranked closed by increasing GHG levels as well. While this may seem to be a minor effect YTY, it is persistent, additive and will be augmented by increasing CH4 contributions to some degree pretty soon. When multiplied by the need to radiate much more heat due to vastly increased energy absorption in the summer, it is likely to make quite a difference - even in the next 20-30 years. I came across a paper somewhere postulating a very thick cloud layer in the winter blanketing the Arctic and keeping things warm enough for cold blooded critters. Without ice cover, we'll have lots of extra water vapor. So, given the explanation by Artful Dodger as to the cause of Arctic cyclones (something about the differences in temperatures) could large expanses of open water north of Asia and dramatically dropping temperatures over the ice covered pole trigger frequent cyclones in late melt and early freeze seasons? Early Eocene had CO2 levels of 3500 ppm and high methane levels, too. All of that ended with the Azolla "event" (the length of which was still several times of man's written history) when Azolla plants consumed the CO2 from the atmosphere and then died, the remains falling into a dead sea without decay, resulting in a permanent loss of that carbon to the atmosphere. We also had Palms that can't survive below 50f on Ellesmere island so something kept the temps up over the cold period? We know the natives spot leads today by the Arctic Sea smoke they produce when water hits very cold air so why not thick fogs/low cloud from the warm waters below? When the ice has gone we will have warm surface currents running trans polar so we have a constant 'radiator' across the basin. The question has to be 'when'? Thanks for the neat reads on arctic reptiles. "The question has to be 'when'?" Great article from wunderground on how fast changes can happen. In fact, how fast has been the norm until recently. "During the past 110,000 years, there have been at least 20 such abrupt climate changes. Only one period of stable climate has existed during the past 110,000 years--the 11,000 years of modern climate (the "Holocene" era). "Normal" climate for Earth is the climate of sudden extreme jumps--like a light switch flicking on and off." The Great Ocean Conveyor is in charge, ultimately. If palm trees on Ellesmere are mostly about warm water, then we might have palm oil plantations on Ellesmere Island soon. Yes, another way we can continue our addiction - with the help of Arctic biofuels. This new world really is looking brighter every day! Interestingly, the "normal" of the last 110,000 years, the sudden jumps, is representative of a system that is in a highly chaotic state, and hasn't yet found an energy state that can overpower the chaos, and take it to a fundamentally more stable place - the extreme ends of either hot house or ice house. It seems more than likely that interglacials could be one end of a most extreme part of this chaotic imbalance, missing a push to take things just beyond the threshold needed for moving fully into a new phase. There is evidence that the interglacials have been steadily weakening, and getting colder and shorter. The system, left to its own devices, may have been slowly heading deeper into the ice house phase. We've devoted a substantial amount of virtual ink to the calving events of Petermann, Steensby and the retreat of 79 and others, but little attention has been paid to Humboldt Glacier which has been spawning a parade of burgie bits all season (or at least every time it's been clear enough to see). No momentous events to record, but the continual ablation of the front, particularly near the horn has to have added to Greenland's ice loss. Today;s MODIS images look a little worse than usual. I was debating about mentioning this next thought, as it certainly does veer OT from exactly ASI. I first learned about the Gaia hypothesis at the same time I learned about the Anthropic principle, in the late 80s. Both concepts were largely regarded pretty much the same way then: basically fringe science, if not "mystical" - a word I dislike unless you want to consider everything previously unknown to science, and still yet not understood by science, as "mystical." Since then, the Anthropic principle has become central, for many scientists, to understanding fundamental things about astrophysics and cosmology. However, many scientists still scoff, for good reasons, and even seem personally offended by the idea. Still, the latest discoveries, such as the measured value of dark energy, so strongly support the Anthropic principle, that it is looking more critical than ever. Possibly so critical that if we can't get our heads around it in a larger way, we could be stuck, permanently. The dark energy result, and it's relevance to AP, is so cutting edge that it is not mentioned explicitly in the link above. Basically the measured value of dark energy is so astoundingly small, yet perfectly right, that AP is the only conceivable explanation. I think the Gaia hypotheses stands in relation to biology much the same way the Anthropic principle stands to physics and cosmology. As usual, the softer science is just further behind. I IMS sea ice the last major reference? I have bet a beer about this year being a record year with Ingmar Nordin, a sharp libertarian philosopher who is one of Swedens leading climate change criticists. It is soon time to drink beer and have an interesting conversation about science and responsibility. BlackDragon - Obviously off-topic so I will keep it even shorter, but I can't agree that the anthropic principle (used carefully) has much at all to do with the Gaia hypothesis. The dark energy anthropic explanation is the observation that universes with structure (and all other parameters held fixed) don't have dark energy much (say 100x) bigger than our universe. You could (and people do) make plenty of sloppier anthropic arguments for why conditions on the Earth are well-adapted for humans (or, more obviously, the other way around). But that's totally distinct logically from the Gaia hypothesis, that there's any large-scale organization to those conditions. Also, I don't see any logical connection between Gaia and the Anthropic principle at this time, at all. Just an interesting comparison, possibly, to two very out there theories. between two very out there theories. You raise some very interesting philosophical points that follow pathways of thought that my mind too has often traversed. There is a certain comfort in thinking about some plan or larger purpose for things with "Gaia" taking the place of some form of "god" or "gods", but I look at all the suffering in the world, especially among innocent people at the hands of "nature" and I fail to be moved to think there is a plan. How could Gaia be less compassionate than I am? These are of course outside the scope of this particular thread, but it would be great to find some venue to discuss these further. I think it's more like a Gaia principle, but rather a weak principle: Gaia is indeed a system, but it only continues to harbour life in recognizable form because the system's reaction to crises were coincidentally such to keep life alive - if not, we wouldn't be here. Life will probably be kept alive in the future as long as the future crises are just repetitions of the old ones and the old solutions are still available and still work. If the crisis is new (like global nuclear war) or the old solutions no longer work (because humans interfere with the self-regulation mechanisms) we're in unchartered territory. However I think Gaia as a whole (life on Earth) is currently not in danger, as the planet already had been through near-snowball and through iceless greenhouse eras and is currently far from either extreme. However, mankind has evolved as a species during the current icehouse climate of glacials and interglacials, and civilisation and agriculture during the current interglacial - could human civilisation adapt fast enough to climate changes toward a greenhouse? Maybe not less compassionate. Maybe just "differently-abled" in the compassion department...? Not at all to make light of suffering. Just acknowledging other possible POVs, if you will. Life has two principles that seem to override everything else: profusion and death. That's how we got here, and that's our destiny, whichever side we ultimately fall on. I agree it would be great to find a venue for further discussion. I love discussing philosophical issues (that tend to stay reasonably close to science), but that would have to be somewhere else on this site, if Neven ever thinks anything like that is appropriate. Mostly because I have never found such a great cross-section of clear thinking and humor anywhere else. I don't know of any "philosophy and etc" thread here though, and I don't know if it would fit the rather cool thing that is going on here. I'd leave any moves in that direction to Neven's discretion of course. I will ad Newman Bugt, relatively it is as big as Petermann!! @R.Milson 1) I dnot think steady state can be called for winter primarily the extent depends so much on weather (calm cold air would do wonders for creating that ice). The big issue would be the thickness. That will never get thick again, but storms would pile it thick if it came from the right direction and an early heavy snowfall on new ice would insulate things trapping latent heat in the waters and preventing cold air from getting to the ice to make it thicker. That would be a disaster for the ice come summer. 2) My uneducated belief for the summer would all depend on how early it would be ice free in the summer. (once you get to an ice free summer I think you would always get one unless everything went right for retaining ice including a perfect ice making winter). For the Arctic the earlier you get ice free in the summer the earlier and more violent the Arctic storms would be come because they would have access to a lot of Cold centre power to keep them going. As for the rest of NH, browsing through the many blogs especially this years will give you a wide variety of opinions as to what will happen, most not good for humans habitation. The majority come down to more extremes of weather that will be very slow moving. As for Djprice537 question about previous winter storms, they did not generally last for weeks and generally did not provide a lot of snow, more just blowing what was there. Here is the Wikipedia description of tundra (I know you fail if you resource it Uni this is not UNI): "The tundra is a very windy area, with winds often blowing upwards of 48–97 km/h (30–60 miles an hour). However, in terms of precipitation, it is desert-like, with only about 15–25 cm (6–10 inches) falling per year (the summer is typically the season of maximum precipitation)." SEARCH updated today. The values range from 3.2 Mkm2 up to 3.9 Mkm2.